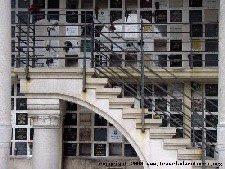 Spirit of Black Paris: Where Our Expatriates are Buried. Where Our Expatriates are Buried. There's no denying the kinship and inspiration that comes when you can touch the door, sit in the café, or gaze up at a Parisian window where one of our African-American expatriates spent significant time. But there's nothing that brings an abrupt pause like coming upon the final resting place. Three major Paris-based Black writers died during the month of November - Richard Wright, Chester Himes and James Baldwin. If you plan to add a visit to their graveside to your European itinerary, be prepared to travel to cities that evoked in them a deep personal attachment. 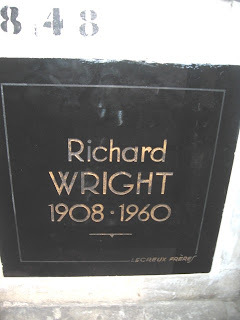 For Richard Wright, that was Paris, of course. 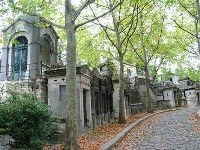 He died on November 28, 1960 and is cremated and interred at the world's most famous cemetery, Père Lachaise. Located in Paris' north-end 20th district, from the outside, its high stone wall hides all but the tallest monuments and crosses. But once through the portal, it's hello wonderment of sculpture/grave sites and winding passages, shaded by robust autumn trees. In here, moss grows over angel's wings, stained glass gets broken, and despite a map in hand, you can get lost or distracted in about 3 minutes flat. On a day too fine to be October, a small group of us went looking for Richard. 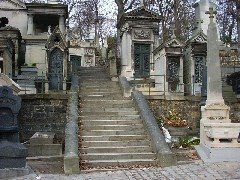 He was a brilliant star in the firmament of literature and Franco-American politics, but in this cemetery, he lays cheek-to-jowl with the unknowns and the famous (Oscar Wilde, Stephane Grapelli, Jim Morrison, Sarah Bernhardt, Frederic Chopin, Molière, and Proust, to name a few). The map said the Columbarium was north and west, in section 87. So we headed uphill, thin-soled shoes bending to the humps of cobblestone. And up, and up, trying to follow the various alley names. And we took shortcuts, hopping down precarious gaps between sepulchers, peeking in broken tombs, and finally, made it. Must see: see the link* below to view Julia Wright's tribute and reading beside her father's grave site, as featured on the blog of Kaleem Ashraf, PhD student at Sheffield University. It was recorded during the American University of Paris' Richard Wright Centennial this past June. Paris brought fame and fortune to Chester Himes, who died November 12, 1984. But he's buried in Spain. Why Spain, after his detective novels won him literary prizes in France? The Michel Fabre/Edward Margolies book, 'Several Lives of Chester Himes' says, for one thing, real estate was far more reasonable than Paris in the 60s, so he and soon-to-be wife, Lesley Packard, could finally afford to own. 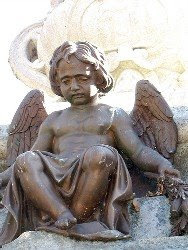 And, after his arduous journey to recognition and express his bitterness, Spain felt like a place for him to rest, a place to run from his inner demons. Himes' health deteriorated from 1974, beginning with arthritis, a stroke, and finally, Parkinson's Disease. 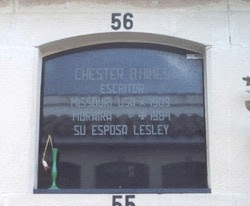 He is buried in a tiny town a few miles down the coast from his home in Moraira, in Alicante province, in the Ceminteri di Benissa. And if you're in the south of France, St-Paul-de-Vence to be specific, is where you can follow the last of James Baldwin's spirit. In this medieval town perched high in the Vence hills, intriguing with its maze of steep streets, Baldwin bought a farmhouse. St.Paul was also called 'village of artists' by those who made it home since the 1920's - Picasso, Chagall, Matisse, and Modigliani. According to the tourism office, it's not possible to go inside Baldwin's former home but you can walk around the outside. He died here, just past midnight November 30/December 1st 1987. But he's buried in New York, at Ferncliff Cemetery in Hartsdale. Exact location: Hillcrest A, Grave 1203. Photo credits: Angel http://wherestherevolution.blogspot.com/2008/03 ; Chester Himes by Claude 46500104 Find a Grave. All others copyright. My father's mother was Chester Himes' first cousin. Thank you for including him in this blog post. Next time I am in Paris I know where to go. If so, contact me through that site. Thanks for the pictures. I often wondered where they rested. Signs of Progress in Black France?